Most movies about teenagers or made for them do not last long in the viewer’s memory. The horror genre is not an exception, especially if it’s made to impress us a bit but has no sharp teeth to bite. One tendency I see in such movies, is their potential to boost the popularity of young talent, who might become famous and skillful actors one day. What I saw in “Happy Death Day”, and I hope you will see that as well, is a sweet reminder of why movies like this won’t go down in history without a fight. Before it reaches the dark nook of forgotten movies in your mind, this film, for sure, will stay alive as long as it can. And I’d say it quite deserves it. Not as scary as you might expect, the film is cleverly made, and uses the best concept possible. Oh, and my goodness, it delivers so much fun! Tree (Jessica Rothe) is not the best person. She knows how horrible and senseless she can be. Still, whether her dark side comes out accidentally or intentionally, she (and absolutely nobody on this Earth or outside) does not deserve the faith that is waiting for her on her birthday. It is 9 AM, Monday the 18th. Tree wakes up in a room at boys’ dorm at Bayfield University campus. She remembers nothing about her last night and does not care to learn anything about it when she sees the young man named Carter (Israel Broussard), whom she has spent the night with. The last night might seem not so eventful for her to keep it in her memory, yet the new day, that has just started, does promise some overwhelming experiences where she must wake up and die before the midnight. From the moment she realizes that she has ended up in a wrong guy’s room, she does everything to ruin the entire morning for him and everyone else she meets on her way. First, Carter’s Asian friend gets a portion of Tree’s nastiness; then a young woman who is collecting signatures; and even her roommate Lori (Ruby Modine) who has made a birthday cake for Tree, which ends up in the garbage bin. Tree does not appreciate Lori’s efforts and care for her. Later that night, Tree is on her way to attend a party that is organized especially for her, though she does not know that. 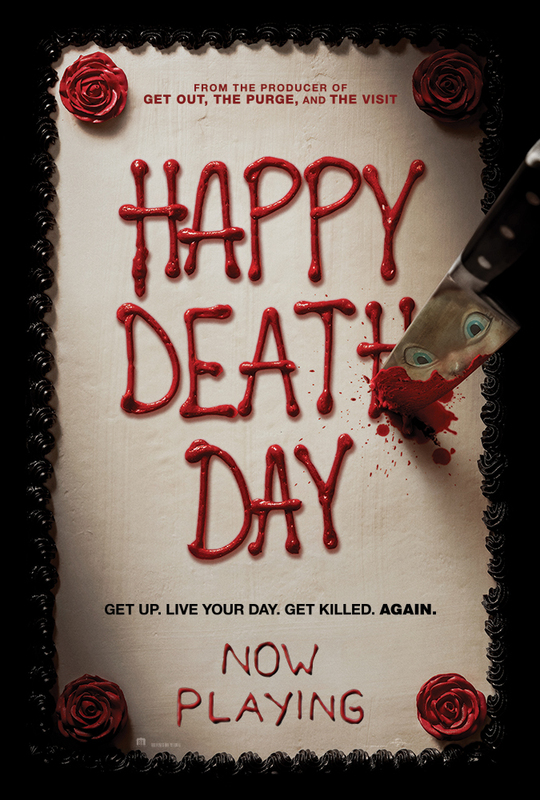 “Happy Death Day” is a movie that could not go wrong. It has a decent screenplay written by Scott Lobdell and directed by Christopher B. Landon. The actress Jessica Rothe delivers amazing performance, turning this mysterious thriller into an intelligent horror movie with so many entertaining scenes. My favorite part of it are, of course, the dialogues which will win over even the most indifferent viewer. To conclude my review, Landon’s movie is a great Friday night entertainment, where you will be stunned by Tree’s horrific day, her way of celebrating her birthday, the changes she undergoes over the course of the story, to learn one thing in the end – the death is the only way for her to turn into a decent person and to learn to appreciate her friends and the things around.